Common Name: Translation: "sand dusted." 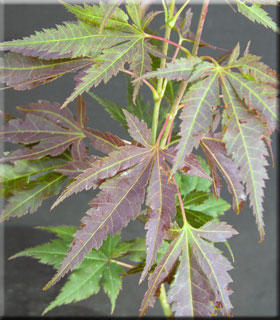 Comments: "Sand dusted" describes the unique variegation of rich purple-brown with tiny green spots that occurs on the leaves in mid-late summer. Fall colors yellow, orange and red. An unusual and attractive addition to the garden. NOTE: These are in 15 gallon pots and too large for our boxes. Can be sent freight or nursery pickup. If interested...please inquire.